Every year on the 4th of July some thousands of Americans choose to celebrate Independence Day in their own way. Instead of lighting sparklers, they gather to watch the greatest food battle go down at the Nathan’s Hot Dog Eating Contest. This year, the 2019 Hot Dog Eating Contest predictions suggest Joey Chestnut and Miki Sudo to retain their title. As an American, you might say that the unhealthy contest is nothing to be proud of. Yet, frankly America ranks number one worldwide in choking down soggy hot dogs. 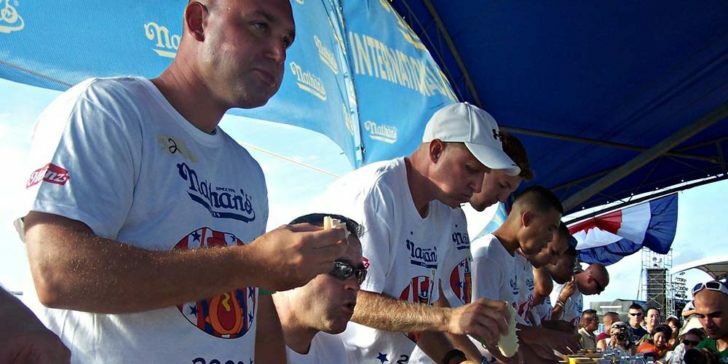 The most famous Nathan’s Hot Dog Eating Contest has been held for 103 years. This year, once more, it will take place on the 4th of July in Coney Island. Dozens of competitors will try to consume as many hot dogs as possible in 10 minutes to win the “Mustard Belt”. In 2018, both champs Joey Chestnut and Miki Sudo dominated the online sportsbook news in the US by winning again. Thus, they are coming back this year. And, they stand as hot favourites to retain the title, according to the 2019 Hot Dog Eating Contest predictions. The current reigning champion Joey Chestnut is like Bill Russell of the competitive eating. It may be unfair to compare a competitive eater to the greatest basketball player of all time. 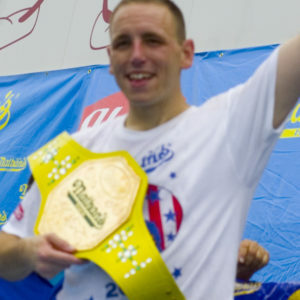 However, after winning Nathan’s Hot Dog Eating Contest in 11 of the last 12 years, Joey Chestnut became synonymous with some of the greatest athletes to ever live. Chestnut remains the top favourite with -1250 odds to dominate the scene again in 2019, according to 22BET Sportsbook. Last year, he broke his own record by swallowing 74 hot dogs in 10 minutes. Shockingly that can feed a person for upwards of 30 days! Some think it is all about having a hearty appetite, but for Chestnut it is also about technique. The big question for this year is whether anybody has the slightest chance to dethrone Chestnut. In 2015, Matt Stonie was able to pull off the upset, consuming 62 hot dogs against 60 for Chestnut. Yet, afterwards Stonie regressed and could not win again. This year, the rising star Carmen Cincotti will try to overthrow the 11-time champion with +600 odds. If Joey Chestnut is Bill Russell, then Miki Sudo is either Diana Taurasi or Maya Moore. Miki Sudo, with her bleach-blond hair, 5-feet-8 inches tall and 125 pounds, is the fastest-rising female star in competitive eating. Last year, she became women’s champion for the fifth time, consuming 37 hot dogs. However, she came short of the 41 hot dogs she ate in 2017. Online sportsbook sites in the US expect Sudo to stay on top even if she failed to beat herself last time. Her odds are -1000 to win again at 22BET Sportsbook. However, if you think she is losing her appetite, you can bet against Miki Sudo with +500. If you are looking for best bookmakers, look no further and check our review about 22BET Sportsbook. Bet on Hot Dog Eating Contest on The Independence Day! Joey Jaws Chestnut Odds Anticipate Victory and Record-Breaking!